Charlie Cobb's business card states that he's the Operational Vice President, Western Territory, for Chicago-based Hearthside Security, Inc. In reality, he's a poorly-paid private detective stationed in the Old West. He augments his salary by padding his expense account at every opportunity. While that may seem ethically questionable, Charlie feels it's fully justified. He claims that a man named J.J. Gideon tricked him into signing a contract with Hearthside after framing him for a crime. Gideon (whom we never meet) assigns Charlie to protect a woman who alleges to be Charity McVea, an heiress kidnapped as a young girl. Five previous women have claimed to be Charity, but all were exposed as impostors. The stakes are high as the real Charity will inherit a $2.5 million ranch from her father. But what initially seems like a routine job becomes more complex when there are two attempts on Charity's life. Who is trying to kill her? Is she truly the rightful heiress or just another impostor? And why is there a Pinkerton detective disguised as an upscale brothel madam? Pernell Roberts as the sheriff. Made in 1977, Charlie Cobb: Nice Night for a Hanging was a made-for-television movie that doubled as a TV series pilot for Clu Gulager. It boasts a strong pedigree both behind and in front of the camera. The screenplay was written by Peter Fischer, whose name may be unfamiliar. 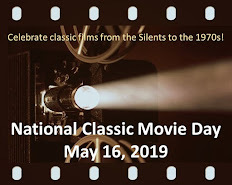 However, he was a prolific writer on some of the best TV shows of the 1970s and 1980s, to include Columbo, Ellery Queen, and Marcus Welby, M.D. His claim to fame, though, is that he later created Murder, She Wrote for Angela Lansbury in 1984. 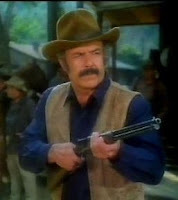 Charlie Cobb was produced by Richard Levinson and William Link, who also contributed to the story (they worked with Fischer on several earlier shows). Levinson and Link may be best remembered for creating Columbo, but they were famous long before that. The duo met in junior high school and went on to write for classic TV shows like Alfred Hitchcock Presents and The Fugitive before becoming producers. 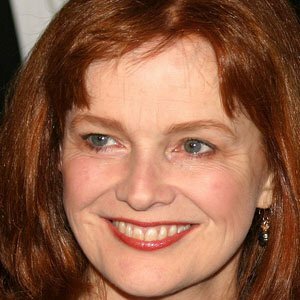 Blair Brown and her radiant smile. Although Charlie Cobb boasts an impressive cast for a made-for-TV movie, veteran performers like Stella Stevens, Ralph Bellamy, and Pernell Roberts have little to do. The script relies on Clu Gulager as Charlie and a young Blair Brown as Charity to carry the load. They're up to the task, with Brown exhibiting the vitality that catapulted her to brief theatrical stardom in films like Altered States and One Trick Pony (both 1980). 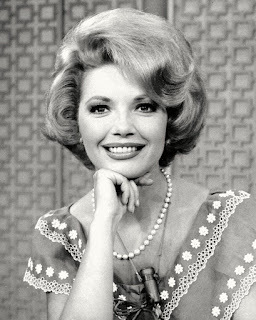 She later garnered critical praise for her TV series The Days and Nights of Molly Dodd (1987-91). 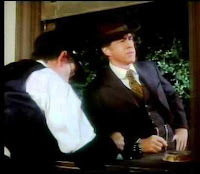 Clu Gulager (right) as Charlie Cobb. If made in the early 1970s, when Butch Cassidy and the Sundance Kid briefly sparked interest in lighthearted Westerns, I think Charlie Cobb: Nice Night for a Hanging would have resulted in a TV series. It's still an entertaining diversion and, surprisingly, it recently popped up on Movieplex--which is good news for Clu Gulager fans. Peter Fischer was essentially a protege of Levinson & Link: first on Columbo, then on Ellery Queen. As time went on , L&L godfathered Fischer through several other projects, including Charlie Cobb, which was apparently earmarked as a Mystery Movie element. Ultimately came Murder, She Wrote, which turned into the grand slam - but that's another story. Several years ago, Peter Fischer was "retired" from the TV business; he'd made the cardinal mistake of getting older. These days, he's writing prose mysteries about Old Hollywood, featuring a movie publicist named Joe Bernardi; so far, he's up to sixteen novels, with at least four more in the hopper (all available at Amazon). Fischer's also written a memoir, Me and Murder, she Wrote, from which I've cribbed most of the foregoing (also available at Amazon, and eminently worth getting and reading for yourself). And a Merry Christmas to you and all who know you. Terrific background information on Peter Fischer! Several of television's best writers also became novelists, notably Stephen J. Cannell and Anthony Horowitz (and I'm sure many others). I always enjoy your enlightening comments at the Cafe, Mike. Merry Christmas to you and yours! I remember when that aired! I watched anything and everything with the names Levinson, Link or Fischer attached to it. 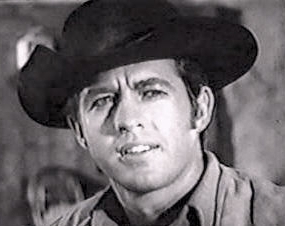 Besides I had (have) a huge crush on Clu Gulager. I'm beginning to think for all the TV series I enjoy, there is probably an alternate universe where all the TV series we didn't get to see are available. PS: Look what you did! I spent the afternoon watching Clu Gulager on YouTube! Clu Gulager is pretty easy on the eyes but I especially liked Blair Brown.